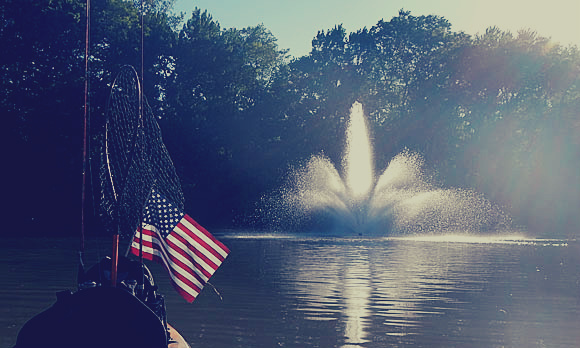 BEREA, OH – It’s fair to say I am more patriotic than most people. I love our country and especially our veterans. I am a strong believer and supporter of American exceptionalism and no words can describe how I feel about those who have laid down their lives for this great nation. While my fishing blog is not used as a political platform, I just wanted to acknowledge my fantastic weekend both fishing and enjoying my family was a direct result of those who gave the ultimate sacrifice. A week had passed since the Children’s Fishing Derby at Wallace Lake that I had blogged about here. I thought there would be a strong likelihood of trout remaining and of course my shot at a Golden Trout. The Cleveland Metroparks released 100 of them in conjunction with their Centennial Celebration. 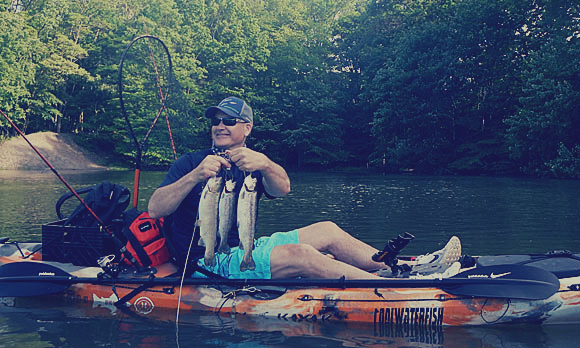 The Golden Trout would continue to elude me, but their was plenty of action to make for a banner day of kayak fishing. In the end, I tallied six Largemouth Bass caught and released and my three fish limit of Rainbow Trout. A few more trout were released after hitting the limit. The bass were caught on 1/32 ounce jigs with Berkley Gulp! Minnows, and the trout all were brought to net via inline spinners. I have no idea what size a keeper bass is as I only release them, but if it is 12″, a couple would have been a little better or under that mark. Two of the three trout kept were rather decent for stockers, I only measured the largest, that fish a tad over 14″. 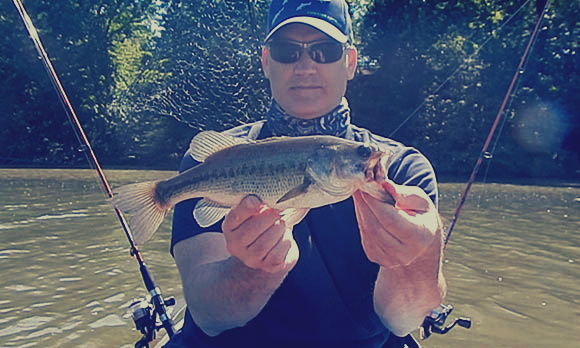 Memorial Day Weekend tends to offer time for a lot of folks to fish. I was excited to see so many people, especially kids, fishing on my Facebook and Instagram feeds. I couldn’t have been happier with the results of my day (well unless I finally caught a Golden), and hope others had success. Even if the fish didn’t cooperate for you, I am certain the time was well spent! BEREA, OH – Some days are just about perfect, today was one of them. 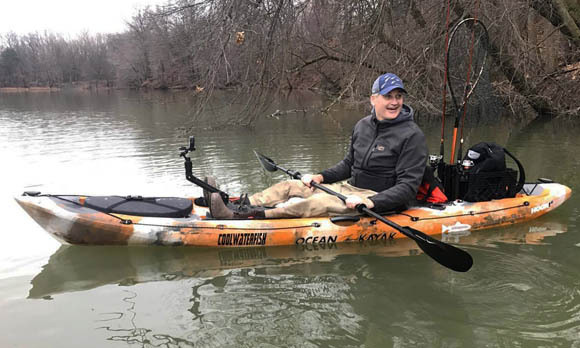 If nothing more would have happened than getting to kayak fish on a 60 degree day near the end of January in northern Ohio – it would have been great. When you add a giant fish, catch and releasing more than a limit of the targeted species, and fishing amongst friends it is truly a special day. 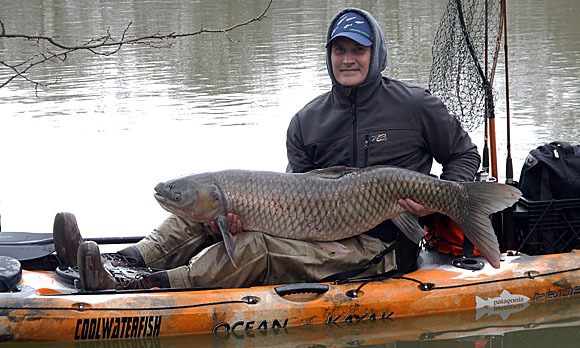 A few years ago, I perfected some tactics to catch Grass Carp at a lake in Medina and the pond in my back yard. The highlight was a huge fish caught by throwing some green leafy plants on the surface, and mixing in a leaf that had a single hook in it. That fish was never documented. In one of those ‘what was I thinking? !’ moments (this particular excuse applies to several memorable fish) I had decided it was necessary to clean the fish off before snapping a few photos. It’s probably not necessary to fill in the blanks, but yes, right out of my hands the fish swam away. I was pretty dejected to say the least. It was my hope whether targeting or inadvertent, that I would encounter the same class fish at some point. Most importantly, that the new story would end with a photo. As you see above, on this day that happened and a bit of fishing redemption was mine. I use the term “a bit” because the other fish took my offering in the mouth and was a catch in the purest sense. Today’s fish ended up snagged after I kept casting where I saw a big fin breach the water. While legal in Ohio for this species, it will never measure up to the first fish due to this. Almost lost in my mind completely over the big fish, was that the targeted species was stocker Rainbow Trout. 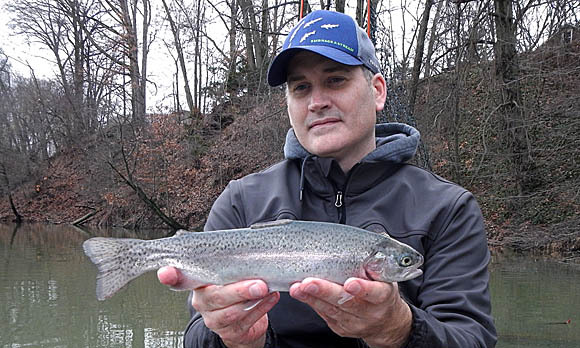 The trout were placed in early December and it was apparent a good number remained. While not fast and furious, I did get my 3 fish limit and continued to catch & release another 3 or 4. A few fish came on the non-glorious (but always productive) Powerbait and the others on a Panther Martin inline spinner. All of the trout I caught were rather small, and all Rainbows. 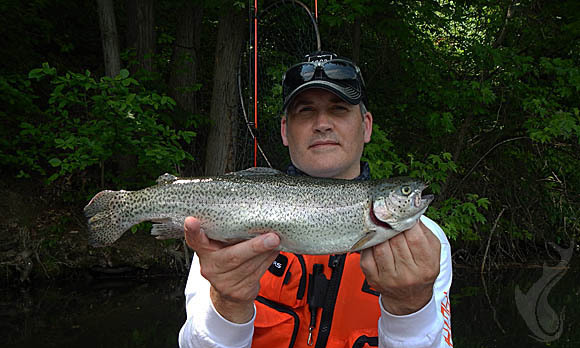 The Cleveland Metroparks do a great job of mixing in some bigger trout, some Golden, and a few others species of trout with most, if not all stockings. I have never caught any of the ‘bonus’ fish despite a substantial effort in the number of times I’ve been out. The author’s reaction to someone else’s big trout! The photo above captures me reacting to someone else catching one of those ‘bonus’ fish I can’t seem to get. I hope it shows my sportsmanship or a lot about my personality to see my joy over someone else getting a nice catch. 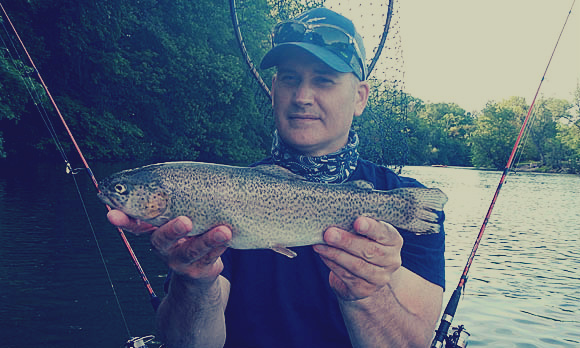 The unseasonably warm weather brought out a good number of kayak anglers, and this fortunate angler landed a very sizeable Rainbow. 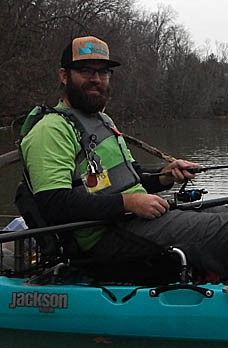 Amongst the kayak anglers on the lake, was at least one face that looked familiar to me. 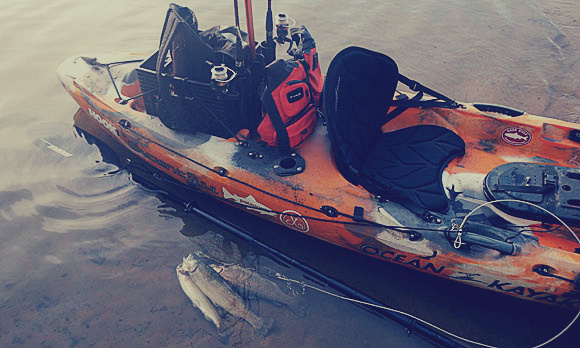 It turns out it was Ken Morris, a Pro Staffer for a few brands and definitely a well respected person in the kayak and fishing community. I had first seen Ken in a Facebook Group we both belong to, CLE Kayak Angers, and it was nice to formally meet. He has a wealth of knowledge and one of those people that freely offers his expertise and insight. I hope to do some planned fishing trips with him in the future. 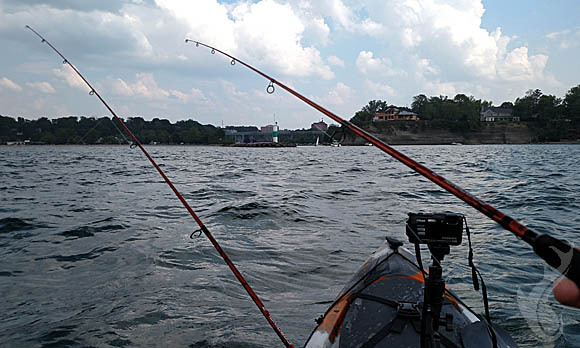 Ken mentioned the River Bassin Tournament Trail, a paddle-powered catch, photo, and release fishing tournament series. It looks really outstanding and I wanted to give it some exposure on my blog. Check it out!